Friday and Saturday I worked on porting my Perl version of a static tumblelog generator to Python. Even though I hadn't programmed in this language for quite some time I was able to write Python fluently again after a very short time. One advantage of doing this, besides getting fluent in Python once more, was that I was able to refactor the Perl version here and there. Moreover, I found two bugs in the Perl version while porting. One was minor: the use of a global variable instead of the one passed as an argument to the function call, which didn't change the execution of the program. The second one could have caused unexpected output: I matched dates in the markdown input with the multiline flag, which would match a date in the right format in a blog entry as well. Both bugs have been fixed in the latest version available on GitHub. Great care has been taken to make the generated blog of both the Perl and Python version identical. This meant I had to make a few small modifications to the Perl version. The only difference between the two programs is in the output of the errors and --help. A screenshot of my tumblelog Plurrrr. 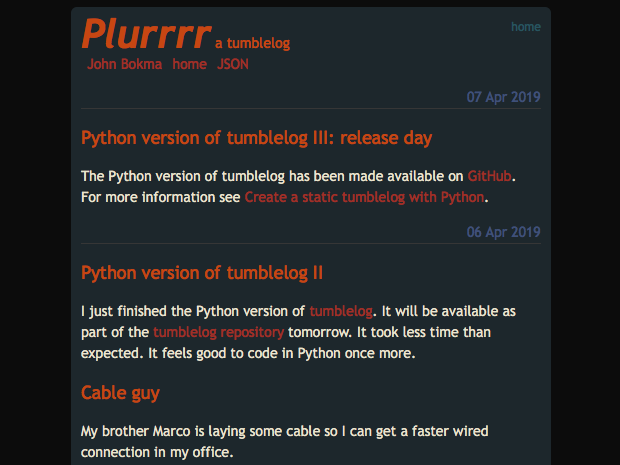 I have my own tumblelog named Plurrrr which is generated using either the Perl version, which has the exact same output as the Python version, in case you want to look before you leap. The following steps assume you run Ubuntu 18.10 or related. Make sure to check for updates regularly using git pull. Please take some time to read the help shown. I use Sass, a CSS extension language, to make it easy to create new styles and maintain the current ones. I highly recommend to use Sass or a similar program in your own projects if you work with CSS. If you prefer a simpler, lighter theme replace soothe with black-and-white (twice) in the above line. Don't forget to keep the file extensions the same. If all works well I recommend to customize the HTML template first. It's probably the best to copy the default template, tumblelog.html to a new file. label: the value "home" on the index page, "week n, year" on the week overview pages and the date on a page for all entries for a given date. css: the name of the CSS file as specified on the command line. archive: navigation section to the archives. year-range: the year range of your posts for use in a copyright message. author - the author of the blog and feed as specified on the command line. name - the name of the blog and feed as specified on the command line. feed-url - the URL of the feed, derived from the blog URL as specified on the command line. Variables have to be placed between [% %] and are expanded by the Python program to their values. All variables, except for body can occur more than once in a single template. If you want to create your own stylesheet I recommend to use Sass and start with copying soothe.scss. Next, edit the colors in the copy you just made until you're satisfied with the result. If you want to share your stylesheet do a git pull request. Use tumblelog.html as a guide for how to write your own blog posts. I recommend to leave this file alone and create a new file for your own blog. Warning: Consider using the h1 element as a top-level heading only (all h1 elements are treated as top-level headings by many screen readers and other tools). I recommend to validate the HTML after each change you made to the template. In each entry you can use Markdown to mark up your blog entry. Each day will generate a stand-alone HTML page. All entries of a week are collected in week overviews. The main page contains the entries of the last days the number of which can be specified on the command line, see tumblelog.py --help. With ti an entry in the SSH config file, located in ~/.ssh. Note that I have masked the port number for security reasons. This set up uses public-key authentication with SSH. Important: use tabs to indent the lines, not spaces in your makefile. In this example I have my website in a different path than the tumblelog project. In your case you might have to change the TUMBLELOG variable besides the line containing the rsync command. Note that I use --delete with rsync because I want an exact copy of the local directory on the server. If you have already a site on the server and want to keep those files make sure to remove the --delete option. For more information, see a simple makefile tutorial. I have taken great care to make the generated tumblelog pages valid HTML, SEO friendly, and Google friendly. With the exception that there is no sensible title because a day can contain multiple blog entries. This could be solved by specifying a title in the Markdown file but this would make things a little more complicated. Moreover, one has to come up with a title that somehow covers several entries. At least that's my case. The generated pages for the current template and style sheets pass Google's Mobile-Friendly Test.